Right before my very eyes was evidence that my bee attractor was working, a bee was busily collecting pollen from the blossom. I couldn’t find my camera fast enough to share my evidence, but I found a different bit of evidence . . . fruit! 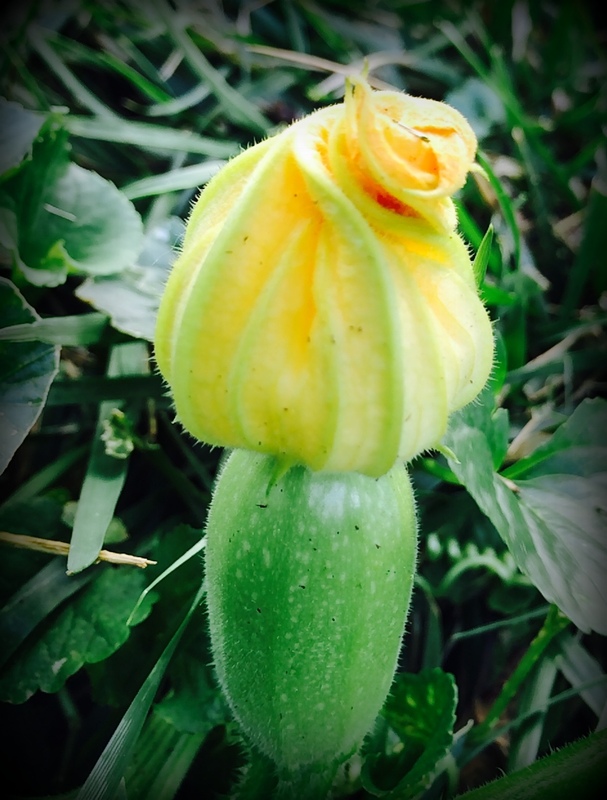 Our spaghetti squash is producing this tangible mystery of seed becoming fruit. I’m still not seeing anything on my zucchini or summer squash plants, but I have renewed hope. Sometimes the finding comes in seeking answers. Maybe there are some things you never knew about a loved one in your life. Maybe you could ask one who knew them better than you did, like my friend, Jeanie did with her mom. This week she shares a great story (evidence of) her father’s work ethic. Click here to read more. I love gathering evidence of God’s goodness. It’s like I’m a detective of sorts. This is especially important to me, when life doesn’t seem very good. Another inspirational story that I read this past weekend comes from Bonnie Gray, in her new book, Finding Spiritual Whitespace: Awakening Your Soul to Rest. Her book is part memoir, part treatise on rest, part journal prompt generator and very much a picture of finding wholeness in the midst of a broken world. I highly reccommend it. As I read it, I was drawn to her story, and found myself skimming the journaling ideas, so I could discover what happened next. I can tell from browsing the journal prompts that this could be a rich group experience. So . . . I am thinking about hosting an online book club later this summer, to read a chapter together and then interact with the journaling exercises. (If you’re interested leave me a comment or email at kelrohlf@souldare.com) Still working out the details of how and when. Hope today finds you increasing in hope and lavished in God’s goodness and love! Oh, Kel, my hub fries up the flowers of squash in the summer (I forget which ones) and they are so good! It is interesting that you want to do a group endeavor with Bonnie’s book; I considered that as well, and threw out the idea after I finished, but the timing was not right so I put it on the back burner for the time being. I agree it would be a wonderfully, soulful journey. Could lead to unknown places of hope, healing and rest. 😉 Thanks for sharing my review. Hugs! Thanks Dawn! I will let you know when I decide whether or not to pursue the book club…I would love you to guest post one of the weeks if I do! Kel, being a God-goodness sleuth reminds me of Karen Mains’s “God hunt.” Truly, we are to seek, and God promises, then, we shall find. My personal purpose statement is “Encouraging Transparency,” and this too leads to discoveries about people. Love what you do here. YOU are such a personal encouragement. Do you mind linking me to your first BE post? I can’t recall the genesis of it. Hope you are enjoying your summer and ant kamp. Lynni- Thanks for your encouragement. I am enjoying my summer and just finished another four days with the kids…now off for a much needed vacation! BTW, I love your new posting mechanism. I’ts so annoying (not exactly right word–I’m not mad! 🙂 to have to re-enter one’s name and email over and over. This is short and sweet, and I love that I can request responses, too, w/o the need to have to go back and ck a blog.